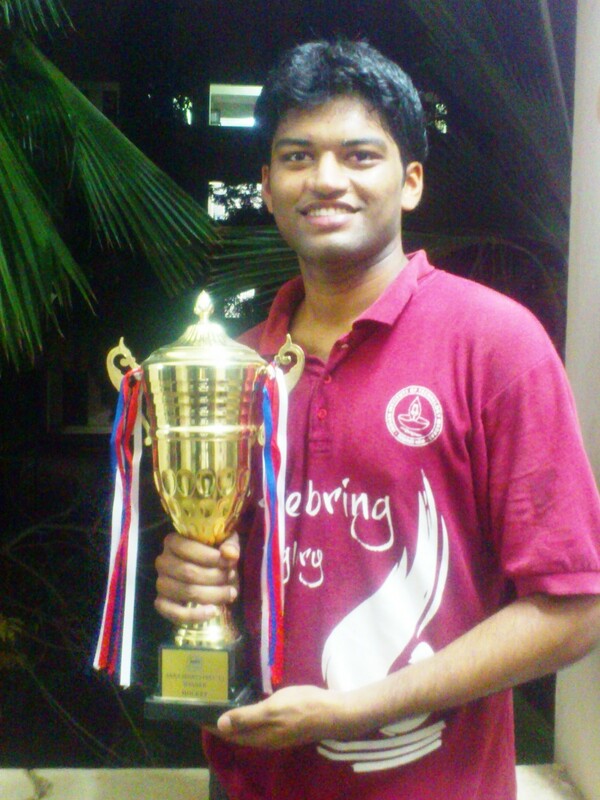 Kaushal Molasaria (Muth) (BT/ CE/ 2013), is one of the all time best Hockey GoalKeeper, IIT Madras has ever seen. He had won Gold for the Institute Hockey Team at Inter IIT, not once or twice but thrice, with his impeccable agility and master tactics at the goal post, when the match was forced to shootouts. He was what Julio Caesar was for Brazil against Chile or more recently like Romero was for Argentina against Netherlands. Read on to discover his journey from being a Tennis NSO to the most formidable Goalee of Garibos. What roles did you play in your hostel and Insti teams? I was a member of Institute Hockey Team for three consecutive years from 2010- 2012. I played as a goalkeeper of the team. For Schroeter, I was a member of Alak Hockey, football and tennis teams. I was again goal keeper in Hockey and football. I won several accolades as a member of these team and was awarded emerging sportsperson award in my second year in 2010. What were your accomplishments with the hostel and Insti teams? With the Garibos we won gold for the three consecutive years. Apart from this, we also won gold and bronze in Anna Fest in 2013 & 2012 respectively. With the Alak teams we won gold in Tennis(2010) and Football(2011) and Bronze in Hockey(2011) & Football(2012). How were the facilities for sports in the Insti and how do you think they can be enhanced? Institute facilities are quite good. However the grounds are not as good as other institutes’ fields. It takes a lot of time to get used to the field condition in other IITs. Can you share a special memory of yours regarding footer and tennis schroeters? The special memory was in third year quarter final match against Godavari. The first 90 min ended 0-0. It was almost 7-7.30 by the time first 90 min ended. No floodlights were there as a result of which it was pretty dark. But we still continued with the penalty shootout. Neither of the goalkeeper were able to save the penalty. I remember one of the penalty taken by Rikin. He blasted the penalty onto the keeper. It was stopped by the godav keeper, but the ball had so much spin that it went in again while the keeper almost celebrated. In the sudden death, we were able convert one and I was able to save the penalty. Everyone leapt on to me. And just when I thought I would enjoy with them, they started kicking me out of joy. Apart from this, The other special moment would definitely be winning the footer schroeter in 2011 and the treat following it :P.
I am not good tennis player. I just have a decent forehand and am not a good server and player of backhand. I just learnt it after JEE. I got selected into NSO. The best memory of Tennis was playing alongside Lathi (Tanveer Singh Chawla) against Godav in my second year. Godav have always had good tennis player – insti A and insti B team level kind of players. I was the weak link for alak (Lathi was superstud), all the return balls were played to me. So we also had a strategy that Lathi would intervene in the return balls to me and finish of the points. That day we already had a tennis match in the evening and then we started our tennis doubles match against Shankar and Abhishek. The weather conditions were also not good as it was very windy that day. We lost the first set due to loads of backhand error and double faults from me. But we made a strong comeback in the second set. We came back from a break of serve to win the set and finished off the third easily. That was the first game where I hit my first ace and scored many forehand winners. I won accolades from Lathi and Godav players. That day was very special as we went into the semis of hockey and tennis schroeter same day. Can you elaborate about your journey of three inter IITs with the Garibos or any other specific memory? The journey right from the fight to seal the place in the hockey place to passing through the Guard of Honor in the final year was very fun and special. The desire to play hockey started off in 2nd semester where our hostel Goalkeeper asked me to try keeping for insti seeing my quadi goalkeeping skills. I was also motivated by SriHarsha (Volley insti player) to try at insti level. I was always the first person to reach the practice while Constant and Hic always motivated me to improve. I went as substitute goal keeper in my first Inter IIT at Delhi and my first inter iit match was against Guwahati (played only for a few minutes). 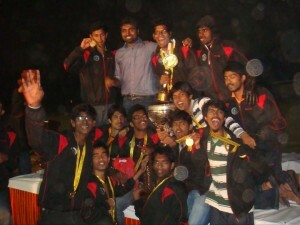 However I got the jist of what inter iit is during this time especially after the semifinal against Kharagpur. Truly speaking, my stint as an insti goalkeeper started in my 3rd year. My first win in a penalty shootout was against Nazerath in Sportsfest. I was able to save 4 penalties out of 5 and we went into the finals of Sportsfest after many years and won silver. We won all the matches that went into a penalty shootout. My record stands at 6-0, out of which 5 are in hockey and 1 in football. 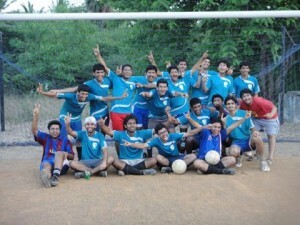 The team that went to Inter IIT Kharagpur was quite strong with few new players. The Inter IIT didn’t start off well as the main centre half Sanju(Sanjesh Kumar Meena..yes another meena) went down with dengue and I was having viral fever after the first game. I wasn’t able play the second game due to weakness. But since we took only one goalkeeper, I had to play the semis and final. We reached into the semis against Mumbai. The game ended in a draw and it was a penalty shootout. It was not a good penalty shoot-out as I failed to save 4 easy ones. However I was able to save one and thanks to my team which converted all the strokes. We went into the finals against Delhi which again ended in a draw. This time Ganapathy Anna motivated me by saying “I don’t want to take penalty this time”. I was almost able to prove his statement right by saving 4, but I wasn’t able to save the last one. He converted the last penalty and we won Gold for the second time. We went to play in the Anna fest for the first time as a team in 6th semester and we won bronze. 4th year was a bit tricky. I decided to go for Inter IIT despite placement pressure. I would say the best memories lie in my last Inter IIT. We were able to go pass in the leagues into semis against Roorkee. Thanks to Tatte(Rakesh Divya) and Constant(Prakool Shreevats) for coming to Roorkee for cheering. The games ended in 1-1 draw and it was followed the 8 seconds field stroke. After my last year show against Delhi, I decided before the shoot out that I will save all the field stroke and that did happen. I was able to save all the 4 penalty shoots (with bala and ziggy converting from our side) and we were into the final for the third time in a row. Everyone- (whether hockey or non hockey junta) came running to me and literally killed by pouncing on me. Thanks to Ravanan for saving me that time. :P..This was probably the best time I had during my Inter IIT stint. The final against Bombay was pretty boring for me. I didn’t get a chance to save a single shot and we won the finals 2-0 easily. It was followed by the GUARD OF HONOR from my teammates. The last time I donned the Number ‘01’ jersey for the Insti was against Anna University during Anna Fest where we won GOLD for the first time. In general, the best part of Inter IIT was the gruelling training sessions, the fun of train journey, the cheers and anti cheers from the crowd, post winning GC march past in Inter IIT Delhi, the exchange of words during the march past session, the DJ sessions during Inter IIT, Gala dinner in institute as well as host Inter IIT and most importantly post finals b*** party. :P.
Kaushal is currently working at JP Morgan, the Financial major, at Mumbai.